A hobby apiarist and former president of the Philadelphia Beekeepers Guild, Schreiber, 41, works bees in colonies throughout the Fairmount neighborhood. 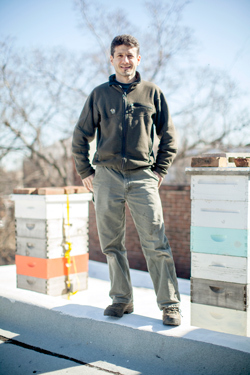 He keeps hives in a community garden, in nearby Fairmount Park and even on the roof of his rowhome. Last season, he maintained 10 colonies, raising approximately 700,000 bees. Bees produce honey to feed themselves during the cold, barren winters; surplus honey is the beekeeper’s bonus. Last year, Schreiber harvested 200 pounds of honey. He eats his fill — on toast with bananas and peanut butter — and sells the rest to family and friends. Philadelphia is a surprisingly rich environment for both bees and beekeepers. For the bees, the city’s abundant ornamental plantings provide a diet more varied than many rural settings. For the city’s 63-registered beekeepers, there’s the four-year-old Philadelphia Beekeepers Guild, which is dedicated to sustainable urban beekeeping and has more than 125 members. The group is a much-needed resource for experienced and would-be keepers, hosting regular meetings, workshops and an annual weekend seminar. May in Philadelphia is a busy time for bees and their keepers. The bee colonies are focused on raising their young in preparation for the nectar flow that comes with the mid-May and June blossoms. The beekeeper must make sure the hives have enough space to accomodate this rapid growth. Too little space can prompt a "swarm," the departure of half the colony for a new home, a natural occurrence that can alarm the neighbors and greatly reduce the season's honey haul. Learn more about the Philadelphia Beekeeper’s Guild at phillybeekeepers.org.